What Play Can Come Along Next Season That Will Be More Star-Studded Than A Delicate Balance? Tony-winning producer Scott Rudin (the man behind the Mormon) and Tony-winning director Pam MacKinnon (whose revival of Edward Albee’s Who’s Afraid of Virginia Woolf? electrified audiences and racked up all the big awards) are teaming up to present an incredibly star-studded revival of Albee’s classic A Delicate Balance next fall, and we can’t help but marvel at the embarrassment of riches assembled. Um, six-time Oscar nominee Glenn Close is one of the most acclaimed actresses of any generation. You know her credits; you’ve seen her in Fatal Attraction, The Big Chill, Damages, Dangerous Liaisons or 101 Dalmatians. And if you’re anything like us, you’ve practically memorized these clips of her Tony-winning performance in Sunset Boulevard. 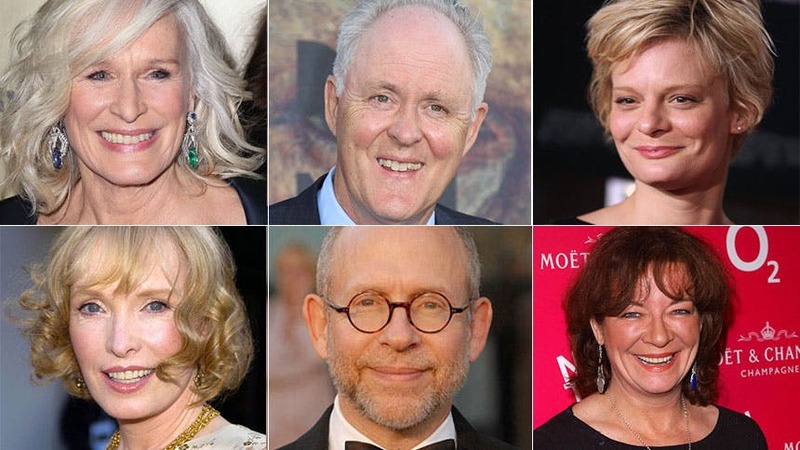 Five-time Emmy winner and two-time Oscar nominee John Lithgow appeared on the popular sitcoms 3rd Rock from the Sun and How I Met Your Mother; he voiced the evil Lord Farquaad in the Shrek movies; he outlawed dancing in Footloose; and he blew our minds on the Showtime drama Dexter. Oh, did we mention he’s a two-time Tony winner? Lithgow arrives back on Broadway hot off his headlining engagement this summer in Shakespeare in the Park. Who didn’t love five-time Tony nominee Martha Plimpton in the films 200 Cigarettes and The Goonies?! Now the Raising Hope and The Good Wife star returns to Broadway after a five-year absence (her last show was the revival of Pal Joey in 2009). Good to have you back! Lindsay Duncan picked up a Tony Award for her star turn in Private Lives and a nomination for her performance in Les Liaisons Dangeruses. She also has a range of film credits, the most wonderful being Under the Tuscan Sun. Duncan walked away with the whole film as Katherine, Diane Lane’s too-fabulous-for-words Italian friend. Tony nominee Bob Balaban hasn’t been on Broadway since 1988! Of course, that’s because he’s been busy in film and television. Here are just a sampling of his credits: Gosford Park, The Grand Budapest Hotel, Capote, Friends, Girls, Seinfeld, Alice, Close Encounters of the Third Kind and the Christopher Guest movies (Best in Show, A Mighty Wind, Waiting for Guffman). Olivier Award winner Clare Higgins has only appeared on Broadway once before, in 2003’s Vincent in Brixton ( Tony nomination). But chances are, American audiences know this British gem from her guest spot on Downtown Abbey or as Julia in the Hellraiser films. The limited engagement of A Delicate Balance begins performances at the Golden Theatre on October 20 and runs for 18-weeks…so get your tickets early.